Let’s face it: scuba gear can be intimidating when you first start diving. From accessories such as dive lights and underwater cameras to essential gear like exposure suits, cylinders, and regulators, there’s a lot to wrap your head around. 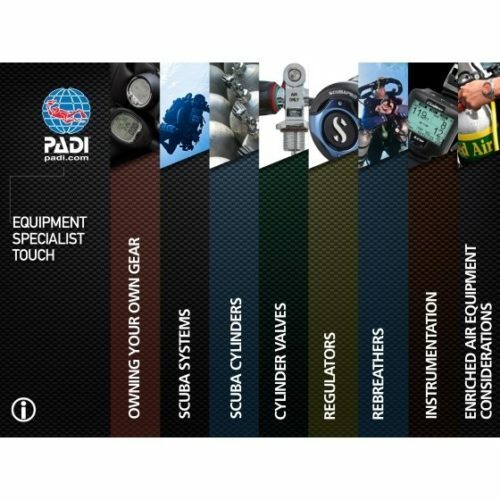 Whether you plan to invest in your own, or just want to learn a bit more about it in general, the PADI Equipment Specialist Touch, a fully interactive and comprehensive digital product for iOS and Android tablet devices, will teach you the benefits of owning your own equipment, how to choose and use your gear and how to care for it after you’ve invested in your equipment. Unfortunately, many divers are reluctant to learn more about their equipment because they feel they’re not ‘mechanically inclined.’ But you don’t need a degree in engineering to understand how scuba equipment works; the PADI Equipment Specialist Course along with the Equipment Specialist Touch will help you to understand how (and why) certain pieces of scuba equipment work. You’ll learn about routine care and maintenance procedures as well as scuba equipment storage recommendations. Your instructor will show you how to overcome some common equipment problems and offer equipment configuration suggestions. Unfortunately for those who are interested in avoiding annual service fees on their regulators, we are not able to offer that in this program. Each manufacture requires technicians to take a special course for the regulators they are qualified to service. You will get to see the insides of several different regulators and learn how they work and what might go wrong. You will also learn how to prevent many of the problems we see during the annual service our technicians perform on regulators, in turn saving you costly fees in the future. We cover the care and maintenance of all dive equipment from masks and snorkels to tanks and regulators. Everyone comes away learning things that they never thought they would learn in this class! This is a great one to do when the weather is cold outside and you want to learn more about diving. There are 2 classroom sessions with this course, but no pools or dives required. At Seaweed Diver, we would like you to bring any equipment you own to class on the second night, but if you don’t have your own, don’t worry, we will have examples dive gear for you to work with during training. Everyone who takes this course comes away with so many tips and tricks for making their diving more enjoyable and their equipment last longer! It is the perfect class for divers of all experience levels too!